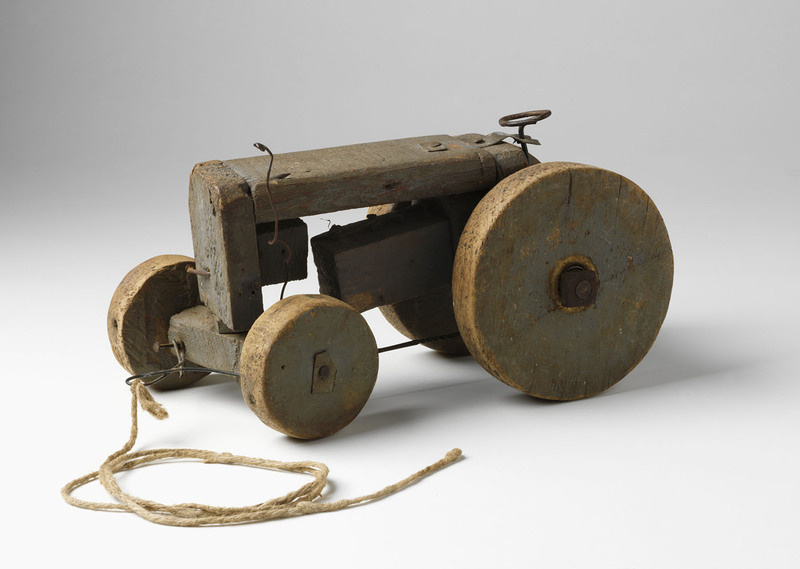 A toy tractor made from old banana boxes, scrap metal and a piece of string shows the childhood ingenuity of a young boy living in Australia during the Second World War. Ten-year-old Brian Burns made the tractor when he was living on a farm in northern New South Wales in 1943. The tractor is an example of a 'make-do' response to supply shortages and wartime rationing. Brian Burns made this tractor in miniature after cajoling his father, Mick, for a Ford Ferguson 9N tractor. The Fergie was quicker, quieter and easier to operate than other tractors on the market. Mick suggested that if Brian wanted the tractor so badly, he should make one himself. Brian used timber salvaged from banana boxes and made a steering mechanism from bits of steel, wire and string he found in the back shed. He painted the tractor grey, just like the Ford Ferguson he was seeking to replicate. Australia was a nation at war when Brian was making his tractor in 1943. The Curtin Government promoted the message that military victory overseas was linked to civilian deprivation and self sacrifice at home. Farming families like the Burns' felt the full brunt of frugality. They were forced to increase production while dealing with supply shortages and rationing. The tractor was touted as a solution for increasing productivity, though Brian's father continued to use teams of draught horses. It was hard work but tractors were expensive and relied on fuel, which was also in short supply. Commercial toy making was deemed a non-essential industry during war. Factories which had produced toys were required to help with the war effort. Toys grew scarce and Brian's tractor is an excellent example of the notion of 'making do'. Brian valued the tractor highly and it moved with him from house to house for most of his adult life. The National Museum acquired the tractor from Brian's cousin, John McNally. Little of its original grey paint remains, but the spirit of childhood ingenuity continues.